We mainly do support in English. Support in Spanish, French and Dutch is possible too. Here is what you can expect from our support. What are the steps to reproduce your issue? What is the current behavior that you observe? What would be your expected behavior in this case? Are you still in migration testing phase or did you already upgrade your production database? What is the current behavior you observe? What would you expect or what was the behavior on your previous version? How to report a traceback? Describe how to reproduce your issue on a standard version. 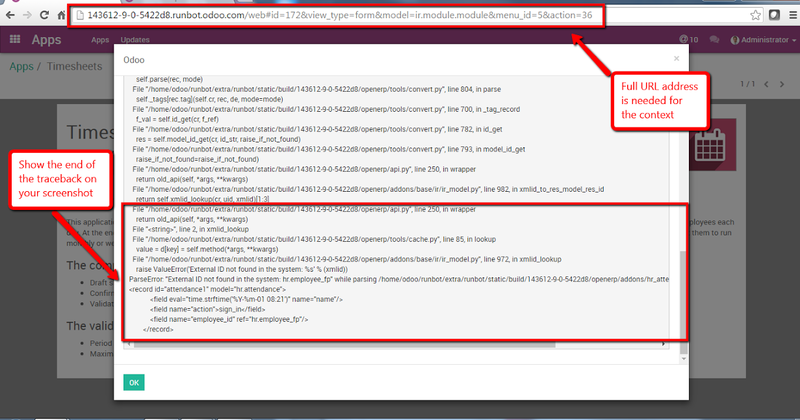 You can get a standard instance on runbot.odoo.com. Provide as much detail as you can, this will speed up the resolution process. If you have difficulties setting up Odoo, we recommend to go with Odoo Online (free for one App). You will still be able to move to on premise afterwards. What is a traceback and what information do we need to have ?